Join us for this special Halloween screening of F.W. 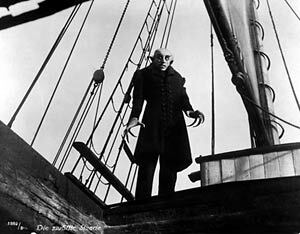 Murnau's silent classic horror film Nosferatu (1922/94 minutes), an unauthorized adaptation of Bram Stoker’s Dracula featuring Max Schreck (vampire Count Orlok), Gustav von Wangenheim, and Greta Schröder. Live piano accompaniment by Ben Model. Image courtesy of Kino Lorber, Inc.